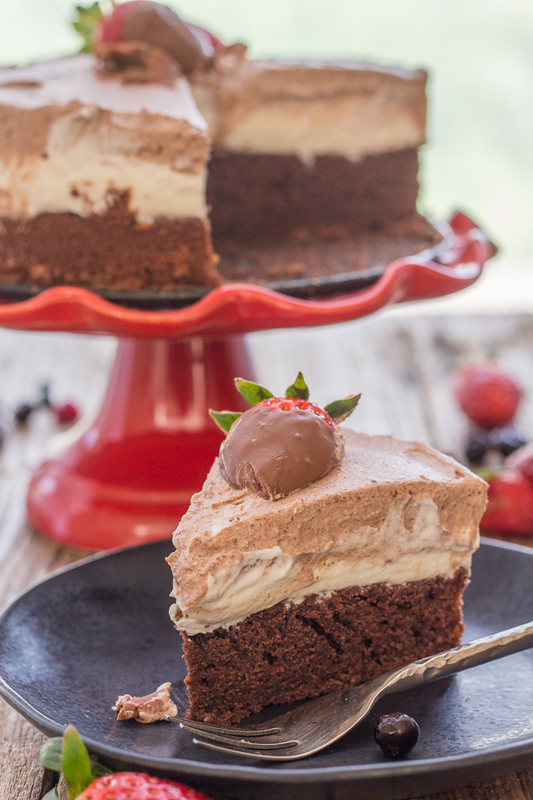 Double Chocolate Mousse Cake, is a moist Chocolate Cake topped with a white chocolate and dark chocolate mousse. Creamy, decadent and delicious. The perfect Special Occasion or Just Because Cake. So Good. It was my daughter’s birthday a couple of weeks ago and to celebrate she chose a Skor No Bake Cheesecake with a Caramel drizzle. 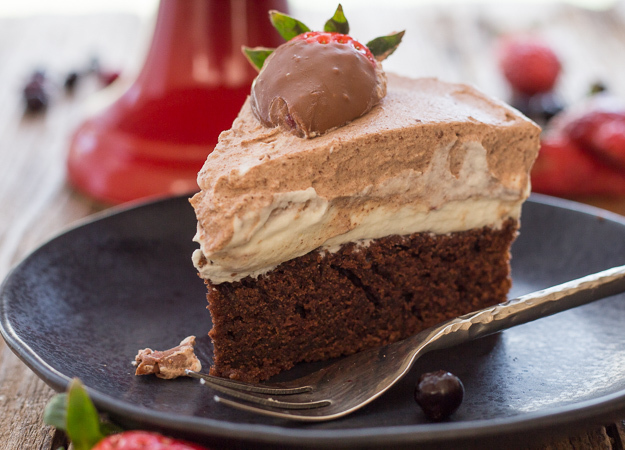 I also decided to serve this Chocolate Mousse Cake as a delicious second choice. We are a cake loving family, so whenever birthdays roll around I let them decide on what their cake of choice is. My daughter loves cheesecake and I have to totally agree with her. So when she decided on a Skor Cheesecake with a Caramel drizzle I knew it would become a family favourite. And I have to say a friend favourite too, that cake was gone, no left overs for us! It’s a good thing I made a second cake. This cake was actually one of my choices. I love mousse and of course chocolate cake. Italians are not big on lots of frostings and overly sweet, so I thought a mousse topping would be perfect. 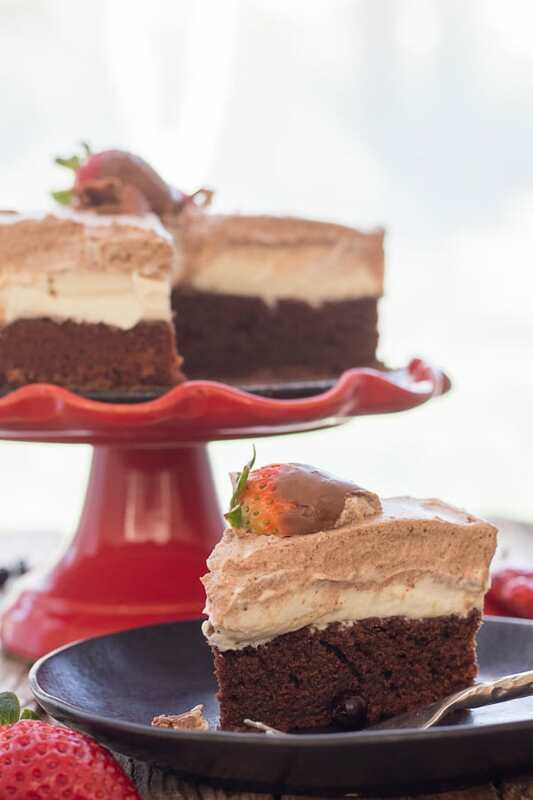 This Double Chocolate Mousse Cake would include everyones favourite chocolate. My daughter (the birthday girl) adores white chocolate and my husband and myself enjoy dark chocolate. And we all love (friends and family included) a light chocolate Dessert. Heat the cream until just boiling. Add the chocolate and stir until melted and let cool completely. Beat remaining cream until stiff. Gently fold the whipped cream into the melted chocolate and combine. Pour into glasses or on baked cake, refrigerate. 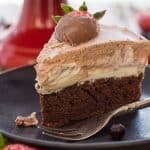 This Chocolate Mousse Cake is the type of cake where you can leave it plain and it’s so good as is or you can fancy it up with some fresh fruit or how about a simple chocolate ganache poured over the top? Heat whole or heavy cream to very hot, stirring occasionally. Pour hot cream over chopped chocolate, let sit 2 minutes then stir gently to combine until smooth. Let it sit at room temperature for approximately 15 minutes to cool and thicken, before pouring it over the cake. However you make it it is sure to please everyone. Enjoy! 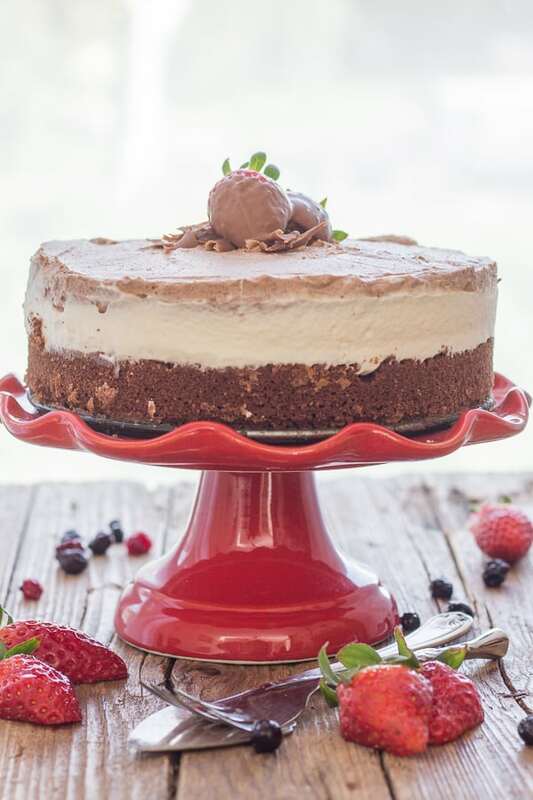 Double Chocolate Mousse Cake, is a moist Chocolate Cake topped with a white chocolate and dark chocolate mousse. Creamy, decadent and delicious. The perfect Special Occasion or Just Because Cake. Pre-heat oven to 350F (180C) grease and flour a 9 inch round cake pan. 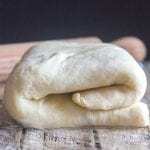 In a large bowl whisk together the sugar, flour, cocoa, baking powder, baking soda and salt. Then add the egg, milk, oil and vanilla and beat for two minutes. Remove the beaters and stir (do not beat) in the boiling water. The batter will be thin. Pour batter into the prepared pan and bake for approximately 30-35 minutes or until toothpick comes out clean. 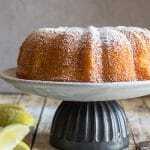 Let cake cool in pan (it is easier to assemble the cake in the pan). While cake is cooling make the mousse, heat 1/4 cup + 3 tablespoons cream until it just reaches the boiling point, then add the chocolate and stir until melted and smooth, let cool completely. Beat the remaining cream until stiff, then gently fold into the cooled chocolate mixture, spoon onto the cooled cake and spread to even out, then refrigerate for approximately 20 minutes. Heat 1/4 cup + 3 tablespoons cream until it just reaches the boiling point, then add the chocolate and stir until melted and smooth, let cool completely. Beat the remaining cream until stiff, then gently fold into the cooled chocolate mixture, spoon on top of the white chocolate mousse and spread to even out, then refrigerate for approximately 3-4 hours or over night. Top with fresh fruit, chocolate swirls or whatever you desire. Enjoy! 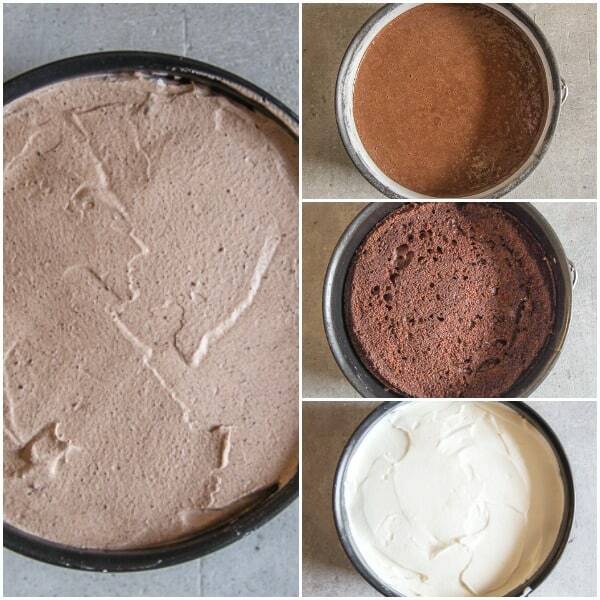 **Any leftover mousse can be placed in cups and served separately. I apologize for the late notice!! Congratulations! 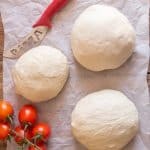 Your post was my feature pick at #ThursdayFavoriteThings this week. Visit me at https://www.marilynstreats.com on thursday morning to see your feature! All hosts choose their own features from the comments left on their blog so be sure to return to my blog to see your feature. I invite you to leave more links to be shared and commented upon. Please don’t forget to add your link numbers or post title so we can be sure to visit! 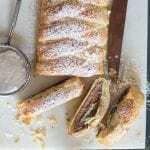 Hi Marilyn, thanks so much for featuring my recipe. Have a great Sunday! That looks amazing! My middle son has really taken to baking in the last year and this will be a great recipe to challenge us both. Pinned. Hi Joanne, thanks so much, I hope you enjoy it! Have a great weekend.